This presentation was created for organization leaders in family law reform. 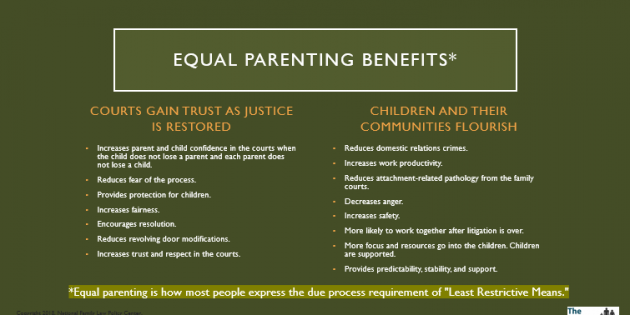 If you want to convince the legislators that an equal parenting (shared parenting) (joint custody) bill is good for children, you will need to know how to handle issues and objections that the bar association and other lobbyists will raise. These slides are intended to help you articulate some of your responses, as well as introduce you to some things you might not have known to be prepared for. Become a member and you will be able to access the PDF and handouts and print them all out. This can be used in all 50 states. Can’t think of topics to cover or how to address the Bar association or other lobbyist objections? Try starting with some of the topics on these slides. When you become a member you can download the PDF and presentation handouts. Donate today and help us help the children. This is a National Family Law Policy Center presentation. Copyright 2018 National Family Law Policy Center.